September marks the end of summer and it also marks the “season finale” of St. Catherine’s Board “Walk” Your Way to Wellness Program. Smithtown, NY - September 10, 2014 - The Board “Walk” Your Way to Wellness community outreach program is an initiative in response to the Nassau-Suffolk Hospital Council’s Long Island Health Collaborative (LIHC). The LIHC represents the partnership of 24 hospitals on Long Island, dozens of community-based organizations, schools and colleges , and the two county health departments—all joined together to connect Long Islanders to better health. Physical activity is just one of the components of the collaborative work. It is also a direct result of St. Catherine’s commitment to its community to assist with prevention health priority areas as outlined in its 2014-2016 New York State Community Service Plan, which can be downloaded at the website. The free community outreach program ran from May through September, encouraging Long Islanders to take part in physical activity throughout the summer. Throughout the summer months health care professionals were onsite at Sunken Meadow State Park with information about health and wellness, including nutrition, heart health, chronic disease prevention and more. On September 4th, St. Catherine’s Breast Health Educator/Navigator Meiling Alsen, RN, MSN/ED, OCN, CBCN, took her place on the boardwalk to educate walkers, joggers and runners, about maintaining good breast health—an important segue into National Breast Cancer Awareness month in October. While the Board “Walk” Your Way to Wellness series has come to an end for 2014, community members can look forward to the program again in the spring of 2015. And, further, St. Catherine’s Community Outreach Program will continue organizing education events throughout the year. 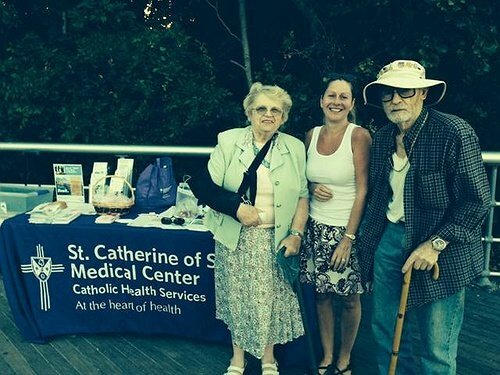 The next event will be St. Catherine’s Annual Health Fair, scheduled for Saturday, September 27th, from 9 AM – 12 PM at 50 Route 25A, Smithtown, New York, under the big tent. The medical center will offer free blood pressure and cholesterol screenings, free flu vaccinations (while supplies last), along with free information on a variety of health issues. For more information about the Annual Health Fair or other free outreach events, please call (631) 870-3444. Photo (L-R): Community boardwalker Ruth Davis, St. Catherine’s Breast Health Educator/Navigator Meiling Alsen, RN, MSN/ED, OCN, CBCN, and community boardwalkerJoseph Richler. For more information about St. Catherine of Siena Medical Center, please call (631) 870-3444. Subject: LongIsland.com - Your Name sent you Article details of "The “Season Finale” of St. Catherine’s Summer Board “Walk” to Wellness Series"